Hello everyone, long time no see! This month has been super crazy, but dear god how are we already in August? 2017 has been flying by, and with no surprise here are some of my goals for this month. I’m not going to lie, I struggled to come up with goals for this month. My life has sort of been plateauing lately it seems, both creatively and professionally. I’m trying to get back on track before the end of the summer, so that’s sort of my larger, umbrella of goals. This month I’m sharing that I’d like to finally open a new bank account and ditch my current, terrible one and save $300 on the financial front. I’ve struggled this month after having to pay out of pocket for a dental procedure and moving, so I need to build back up my savings! I also want to spend more time at my apartment’s pool enjoying summer and maybe get around to finishing a book or two poolside. I also would like to get in more driving practice since it is pretty important for me to get my driver’s license (another adult responsibility I’ve been shirking). Lastly, I would love to stop biting my nails this month. Honestly, it’s more of an anxious tick that I haven’t shaken over the years but I would like to rid myself of this dirty habit. So there you have it, my goals for this August. They aren’t big, life changing ones, but who needs those every month? Sometimes you just need to get back on track and tackle some of the little things. What do you want to accomplish this month? Let me know in the comments below and hopefully you’ll be hearing from me soon! Hello everyone and welcome back to my blog! Today’s post is my July goals for 2017, which is honestly just crazy that we are already 7 months into this year. I’m absolutely pumped for July, I love the summer and I’ve got some fun things coming up this month. 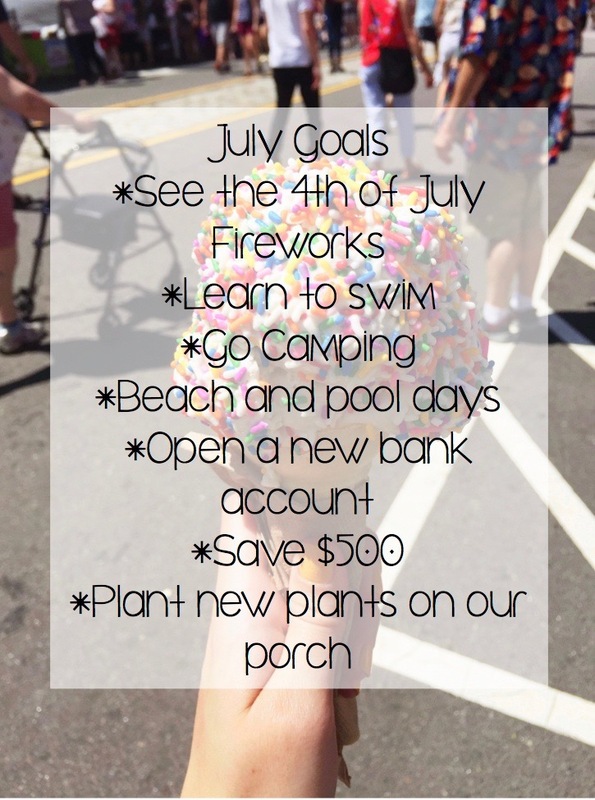 Check out my July goals below! My favorite holiday ever is Fourth of July, so I was super excited to celebrate this yesterday and see some fireworks in my area! Confession time: I am 23 years old and I cannot swim in the slightest. This month I’ve moved into an apartment complex with a pool so I will be learning to swim this month, so I will be learning to swim with all the time I plan to be there! I’ve also never been camping in my life and this month I am going camping with my boyfriend and his family. I’m pretty excited but also slightly nervous since I’m not the biggest fan of bugs or the wilderness. Who knows, it’ll be a learning adventure! The thing I am most looking forward to this month is spending lots of time over at my apartment’s pool and driving over to the beach on the weekends. I love the beach, but will be mostly satisfied anywhere I can lay out in the sun and relax. This month I have two financial goals, open a new bank account that I can use locally and save $500. My bank account doesn’t have any branches or ATMs in my new area so I need to bite the bullet and open a new one. I also just moved, so my savings account has seen some better days. Lastly, I’m super excited to plant some new plants on our porch, since we moved and have more room to have plants. I’m trying to not kill everything I touch so I’m starting off small, but I hopefully will have some pretty flowers by the end of the month! So there we have it, my goals for July 2017! What are some goals or plans you’re looking forward to for July? Let me know in the comments below! See you next time!